Can you believe it, this blog has been going for 4 years now! I never would have imagined in 2010 that I’d still be blogging now. The blog started out as a Japanese fashion (namely gyaru) central blog. My muse, and the gorgeous lady who inspired me to start blogging was Mitsu. I loved her blog and visited everyday, hoping that one day I might be half as amazing. Whereas the blog still features Japanese fashion from time-to-time, it’s obvious it has evolved. Now I’m a lot more focused on European fashion and beauty, as you’ll have noticed over the last few years. It’s not a cliche to say it has opened up a lot of doors for me, some with pretty shiny things behind them, others with amazingly cool people. I have been very lucky to meet the people I have and go to the places I’ve been. I still remember being invited to my first event, and being sent my first pr sample. It’s fair to say I still am shocked when I’m contacted by pr companies, but I am also incredibly grateful. I only hope I can continue to write about the things I love, and everything that’s floating around inside my head. So thank you to those who I have worked with through my blog, but mainly thank you to those who read my blog – you’re the ones who continue to inspire me to blog. Last Friday Tatty Devine sent out their latest newsletter. And guess whose face was beamed out to all of their subscribers? Yep, lucky ol’ me was featured under their ‘How You Wear It’ section. This might not seem like a big deal to some people, but it means a lot to me. I’m such a big fan of Tatty Devine and it makes me happy that they appreciated the post I wrote. 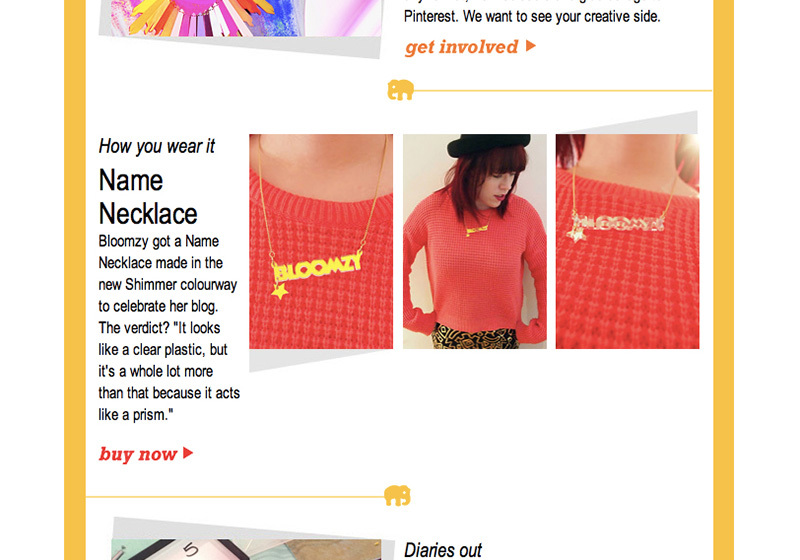 Thank you to Tatty Devine for featuring me, and for everyone who continues to read my blog! Finchittida Finch is certainly a brand name that draws your attention. The twin design duo are the South East London based Lisa & Tida Finch. Their handmade jewellery is inspired by their traditional Lao-British heritage. With jewellery based on their hand-drawn illustrations, these two ladies are very talented. The amazing debut collection draws from their heritage, and is inspired by Lao Temples. Each item is uniquely intricate, with a variety of shapes and designs creating pieces that range from simple to ornately bold. 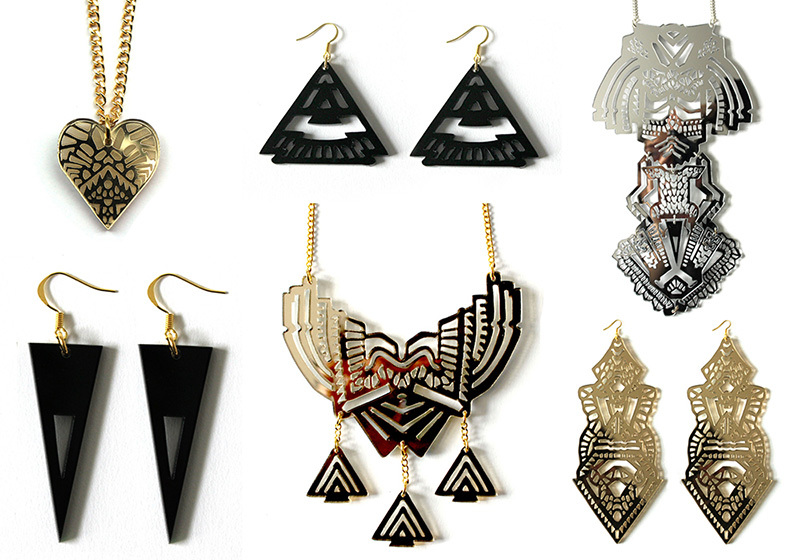 There’s earrings, necklaces, bracelets and chokers, in gold, black and silver mirrored acrylic. Each piece in the collection has been lovingly laser-cut, by hand. I love this brand and the message behind it. Why? Family and celebrating your heritage is very important to me. The strikingly beautiful jewellery may have peeked my interest, but it was the emphasis on these topics and raising awareness for the people of Laos that made me stop and really pay attention. I respect a brand with a strong ethos. That is why I applied for an internship with them when I saw they were looking to take someone on. And I can announce that I am very proud to be working with Finchittida Finch as their new intern! I hope you can all help me in supporting this new amazing brand and their message. You can browse/buy their debut collection online here. Prices start at £10 and go up to £75. Announcement: I’ve moved to London! Finally, I am able to make the big announcement I’ve been keeping a secret for weeks!! 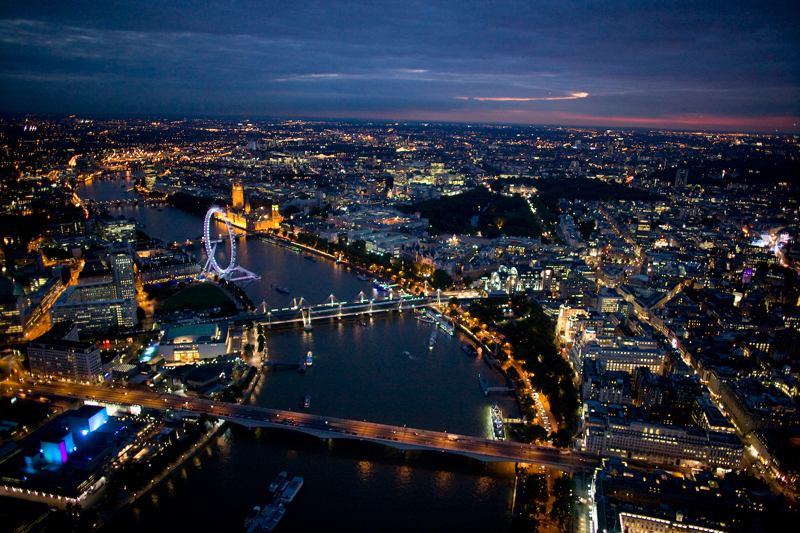 This weekend I moved to London with the fiance. Yep, the big and brilliant capital of England is now my home. After searching for quite a while and visiting various letting agents and searching online (I don’t recommend it) we finally found an amazing apartment in Hackney that we knew we could call home. I’m so excited – it still doesn’t feel real! My hometown isn’t too far from London but visiting for a few days is very different to living here. Luckily we were able to find somewhere in an area we know well and really wanted to live in. We will be doing the grown-up thing and searching for jobs, but I’ll also be making time for fun (of course). It’s going to be a big adventure and I feel so lucky to have this opportunity – hopefully I will be able to share it with you all. However as we have just moved in we won’t have internet access for a couple of weeks. I will still answer emails and Tweet via my phone. I’ll also be trying to blog by visiting cafes etc. Source; I couldn’t find one. If you know the source for this photo, please let me know – it’s beautiful! This is just a quick post to let you all know that I am going away. I will be on holiday from 22nd July to 2nd August, with little or no internet access. I’m afraid this means I won’t be physically updating the blog or Twitter during this time. lined up from some lovely bloggers, which I can’t wait to share with you all – I know you’ll love them! I will be taking comments off moderation during this time, but there may still be problems with IntenseDebate (the reason why I put comment moderation on), so if your comment doesn’t show up don’t worry, I will try to clear it in a few days. So that’s that. I hope you will all enjoy the posts coming up. I’m off to Beaumes de Venise in the South of France, to hopefully catch some sun. I’ll be back with plenty of photos and stories to tell. Bloomzy has a domain name now! I realised that I never made an official announcement on the blog about my new domain name. Well here it is! I have been putting a lot of effort and work into the blog lately, and hopefully it shows. I’ve also been collaborating etc. with a few companies and so I thought it was time to snazz things up a bit. I had been contemplating getting a domain name for the blog for a little while. Hopefully this will make it look more professional, but also easier for my readers to find. You probably remember how I couldn’t get ‘bloomzy’ on blogger, which was just confusing. So please change your bookmarks! Recently I have been receiving offers from various companies, asking me to collaborate with them (in the form of affiliations) or review their products etc. Therefore I thought it was about time that I write a small disclaimer for the blog, and I wanted to explain it to my readers first. I always like to include a small disclaimer, as I don’t want to hide the fact that I have been sent these items. I’m not saying it is a bad thing if you don’t mention it, I just prefer to be up front about those kind of things but it does get tiring having to write disclaimers on every post. Please also note that I don’t accept every item/affiliation. I only accept those that I feel are relevant to my interests (products I want to try, or have thought of buying myself) and the blogs. From May 2012, if an item in a post has been provided by a company or pr agency, or it has been bought with gifted store credit etc. I will be placing a small * next to the product/brand name. This will be an indication that I did not buy the item personally, and that it has been sent/provided to me. I will usually include a link to the website of the company/item. Before 16 May 2012, disclaimers were included in the text of the blog post, or at the bottom of the blog post. If you’re curious as to who I affiliate with, you can find banners and links at the bottom of the sidebar. I do write sponsored posts (as of August 2012) which means that I am being paid to write content for a company/brand, as well as sometimes being provided a product also. These kind of posts will always be declared. This does not mean the integrity of the content will change at all. From 2013 I may be running small ads on my blog occasionally. These will not be annoying (I hate massive ads on blogs) and you by no means have to click on them unless you are interested. These ads are run by Nuffnang, which I am a member of. From Jan 2014 I will have installed Skimlinks on the blog, which isn’t intrusive to you but it may occasionally change links on my blog into affiliate links, and keywords in my posts into links. I will be placing a mini disclaimer about this on the right hand side, alongside my image disclaimer. Please note that all opinions stated are my own – even if I have been sent an item by a company, my views and opinions will still remain 100% honest! I hope you will all understand my decision behind this and continue to support me in the future.